I am pleased to announce the training programme for the Worship4Today course, starting in the late autumn, with two parallel courses running Ely and the Cambridge area. This is course is warmly endorsed by the Church of England Liturgical Committee, PRAXIS and the RSCM. A really good way for those interested in worship and music in worship to explore and develop their knowledge and skills together. Do take a look at the information and see if it's something you should be considering. You can undertake the whole course or just individual modules from it. This blog is currently under reconstruction. Please come back later to find more up-to-date information. Do pass the word on if you know anyone suitable and encourage them to apply. "Let it be known" - the latest song from Worship Central and Tim Hughes (amongst others), accompanied by a video that reflects the current worship style of the contemporary scene. Nothing wrong with either but, increasingly, so far away from the regular worship of our parish churches. Our young people go to Soul Survivor (or similar) and this is how they worship. They come back home and want to worship like this but few churches could make that happen for them. Just as "choir and organ" (Cathedral style) can prove hard in the parish context, my own view is that this is now so far removed from what's achievable in most of our churches that it serves only those with the most modern technical gadgets and musicians skilled in this type of music to deliver the song(s). This is a really helpful reflection by the grandfather of contemporary worship music, Graham Kendrick. Overall, this is actually a rather good website and they are currently running a competition to write new songs including an under-18s category. Graham's own website is available here. Worship Central's UK Tour is coming to Cambridge on 19 March 2013 at the Cambridge Corn Exchange. Doors open at 6.30 pm. Training event - "Music to Worship God"
Does the music seem a bit “tired” in your Church? Are you looking for fresh ideas? Would you like to explore the ways in which music enhances worship and can aid theological understanding and spirituality? If so, this day is for you. This event is hosted jointly by the Ely RSCM Area and the Diocesan Crescendo training programme. Open to ministers (ordained or lay) musicians, and any others (over 18 years of age) who have an interest in Church Music. Canon Michael Hampel (Canon Precentor, St Paul’s Cathedral London) will be the keynote speaker. The day will include some practical workshops, details of which will be circulated prior to the event to all those accepted onto the training. Bookings will be acknowledged by email. If you require a postal acknowledgement, please enclose a stamped, addressed envelope with your booking form. 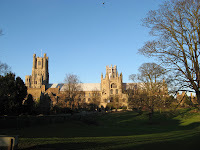 I'm the Hon Bishops' Adviser for Music in the Diocese of Ely and based at Ely Cathedral for my church work. I live in Impington and am married to Denis. We have an adult son.